Yes, strange is a word frequently used to describe Burton movies. But there are different levels of strange. In the case of “Dumbo”: every decision, every scene, every line of dialogue is a bit strange – not in an obscure way, but in a logical, filmmaking way. 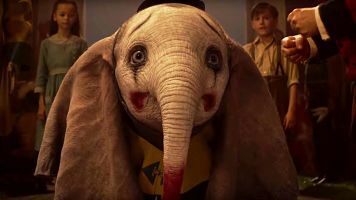 So much so that “Dumbo”doesn’t even feel like a true Tim Burton movie. What Disney, and moviegoers, probably didn’t expect was a dull, unimaginative, gray version of “Dumbo”. This is one of the most lifeless cinematic spectacles ever made. Screenwriter Ehren Kruger (whose credits range from “The Ring” to “Ghost in the Shell” to “Transformers: Revenge of the Fallen”) doesn’t add much to the iconic, yet paper thin, source material. It’s 1919, and Baby Dumbo is born with giant ears from Mama Jumbo. When they get separated, Dumbo is forced to perform in The Medici Bros. Circus, run by Danny DeVito’s Maximilian Medici. The alliteration continues as mogul V.A. Vandevere (played by Michael Keaton in a white hairpiece) buys the circus to make the now headline-grabbing elephant the star at his theme park, Dreamland. But horse rider Holt Farrier (Colin Farrell), who lost his left arm in the war, and his two kids, want to see Dumbo and Jumbo reunited. 10 minutes into “Dumbo” and it’s clear we’re not in for a smooth ride. The scenes are awkward. The pacing is uneven. And nearly every character has a bizarre accent. However, late in the film Alan Arkin shows up, and he sounds just like Alan Arkin. It’s as if he was plucked from doing his Netflix show with Michael Douglas for a few hours as a favor to someone. But this is good, because he delivers the best line in the movie. The animation of the elephants and Danny Elfman’s score are the only inspired elements of “Dumbo”. Even the usual merriment and wonder of a Burton picture — the costumes, the visuals, the imagery—-all underwhelming this time. And the performances—from ear to ear—are at the cardboard cut-out level. Disney doesn’t seem to understand that not all of their animated movies deserve live-action remakes. And the one’s that get them deserve better treatment than “Dumbo” gets. This should’ve been a happy, celebratory, life-affirming cinematic experience. I never dreamed that a film about a magical elephant could be so flat. “Dumbo” isn’t worthy of the Big Top. Instead, it’s a Big Flop. On The Official LCJ Report Card, “Dumbo” gets a D+.